Who'd have thought you'd find dinosaurs in London! 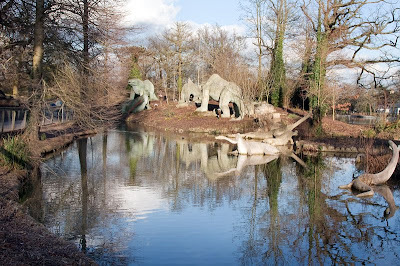 You'll find life size dinosaurs, bears, moose and crocodiles at Crystal Palace park. Looks like they are having fun! It must feel good to see some blue sky. Wow! How do you find all these amazing places? Ha, that is a bit of a surprise! Hah, I knew London was pretty old, but not THAT old! Beautiful pic, I love it! It's possible to see dinosaurs in London also in Oxford Street. Fun looking place! Lots of great play day potential there. Lovely reflections in the photo! Welcome to my part of London - Crystal Palace is a beautiful park - I hope you have saw the spinx! I just love crystal palace park! this is just so weird to walk among those dinosaurs.